The San Diego Museum of Art Artists Guild - The Contemporary Artists of San Diego invade the museum. It's 1929. The Contemporary Artists of San Diego invade the museum. It's 1929. They are celebrating their first exhibition. Do you recognize Charles A. Fries, Jame Tank Porter, Charles Reiffel, Alfred R. Mitchell, Everett G. Jackson and Leon Bonnet and their family and friends? They are all Artists Guild members. The Artists Guild has always sustained the creative life of artists while at the same time, the artists sustained our museum and our community by mirroring the culture and concerns of the day. Who's Who: First row (from left) Charles A. Fries, Alice Fries King, Dorothea Mitchell, Mellicent Lee and Elizabeth "Frankie" Reiffel. 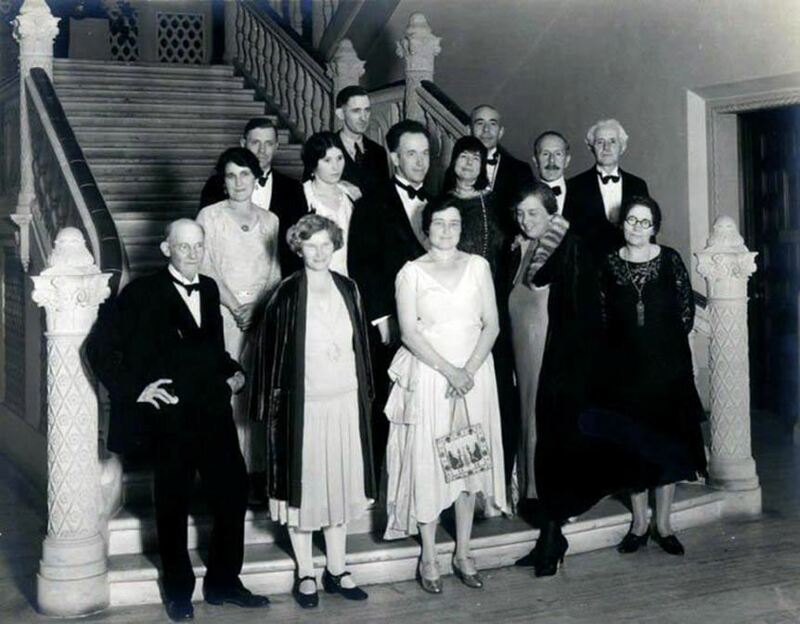 Second Row: Mrs. James Tank Porter, Eileen Jackson, Alfred R. Mitchell, Grace Scofield Bonnet, Leslie Lee, and Charles Reiffel. Back row: James Tank Porter, Everett Gee Jackson, and Leon Bonnet. Maurice Braun, Donal Hord, Otto Schneider and Elliot Torrey, also members, are not shown. Each of these 'giants' from our past will be celebrated in our 100th Anniversary work, 100 Artists over 100 Years. This visual history will show you the artist and some of his/her work with links to more about the artists and their role in San Diego's cultural life. We need your input to make our story reflect your experiences in the Guild. Our small history committee would love to talk to you and welcome you on board if you are interested in bringing our distinguished past into better focus for the future.